This document outlines the steps to complete the initial setup for the new non-application specific catalogue provided in the latest version of autoecat.com. This document will also describe the steps required for ongoing maintenance of the non-application catalogue. The document named xlsx is a listing of all product currently in your stocking inventory. The document named xlsx is a listing of all available product codes used in the non-application catalogue. In order to reduce the amount of work you will need to do, remove all categories that you know do not contain non-application product. 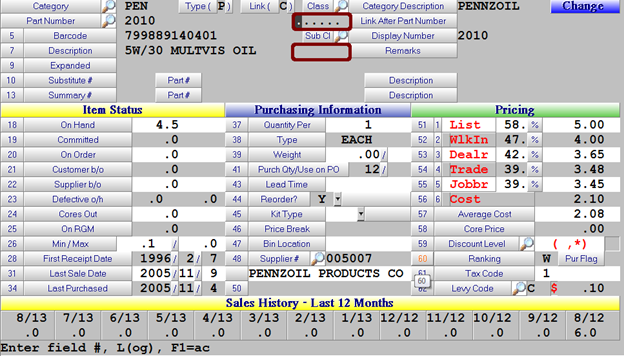 Using the two spreadsheets, match up the product classification codes to your inventory. Enter in any additional comment/description info into the extended description field of xlsx. Step 4. Check the Catalogue Vendor in your category file. If you can’t find a code, let us know. Step 5. Email the completed spreadsheet to jimp@amscomp.com in order to have the updated classification codes uploaded into your system. Continued maintenance of the classification codes can be done through the product master maintenance screen in either (A)dd or (C)hange mode. The two highlighted fields will allow you to add/change the Class & Subclass for a given item. Any new or changed part classifications will take overnight to be updated online.